Squeeze lemon juice into a small bowl, and slowly whisk in olive oil. Whisk in salt, paprika, white pepper, and garlic powder. Split lobster tails lengthwise with a large knife, and brush flesh side of tail with marinade. Lightly oil grill grate. Place tails, flesh side down, on preheated grill. Cook for 10 to 12 minutes, turning once, and basting frequently with marinade. Discard any remaining marinade. Lobster is done when opaque and firm to the touch. Watch how to grill rock lobster tails! These were okay but nothing spectacular like I was expecting from the high rating. I don't think I'll make them again. I did these in the oven and they were fantastic! Delicious! We used regular lobster tails and cooked them for 7 minutes....just cook until they turn white then remove from the grill immediately. 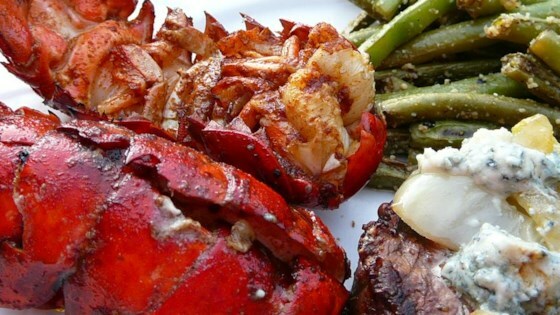 This was our first time grilling lobster and it couldn't have been easier! They only took about 7 minutes and were easily removed from the shell. They went great with drawn butter.